BF strolls along the pristine beach at our hotel. Each winter, my boyfriend and I plan a getaway with three criteria: 1 | there must be a beach; 2 | it must be warm and 3 | it should be all-inclusive. 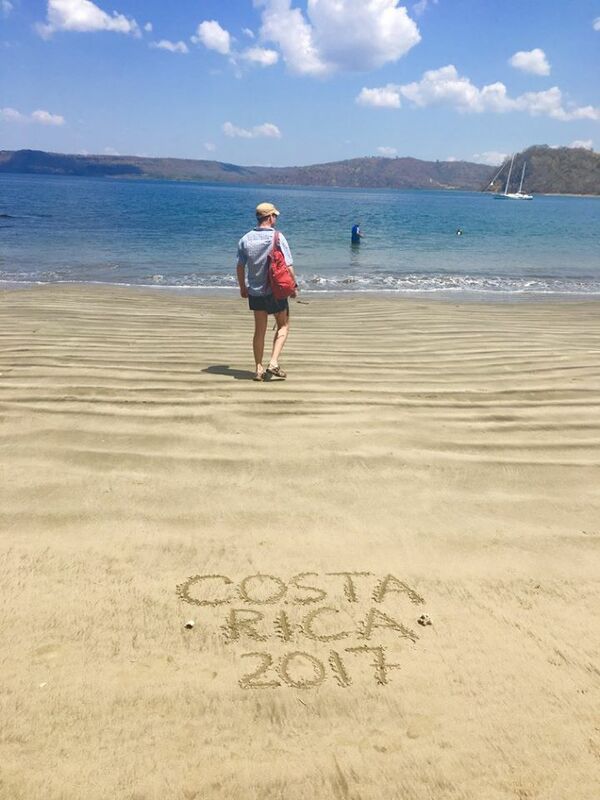 Though I’d been to Costa Rica twice already my boyfriend had never been and it quickly rose to the top of our list. Together, we explored an area of the country neither of us had been to before and had a magnificent, relaxing time. Overlooking our resort from the lobby. self-sufficient via renewable natural energy sources (wind, water, etc.). 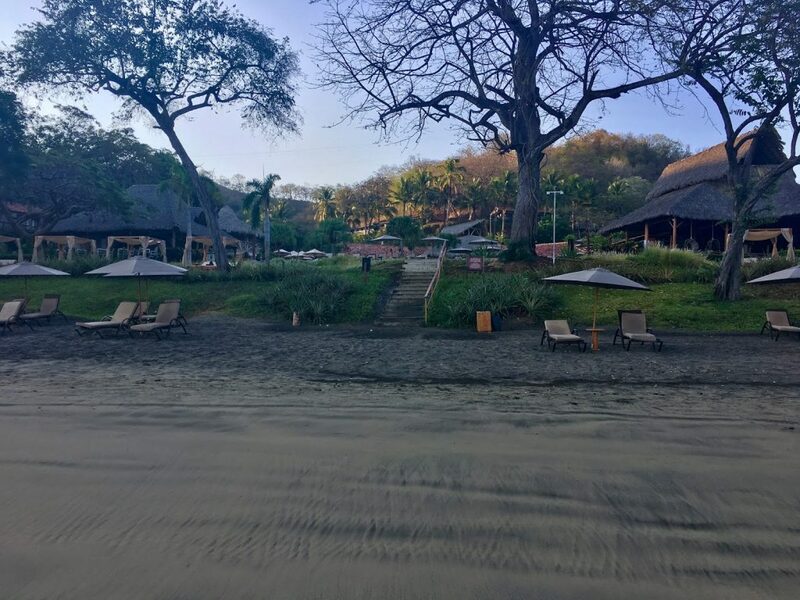 The spectacular and uncrowded beach at Playa Hermosa. 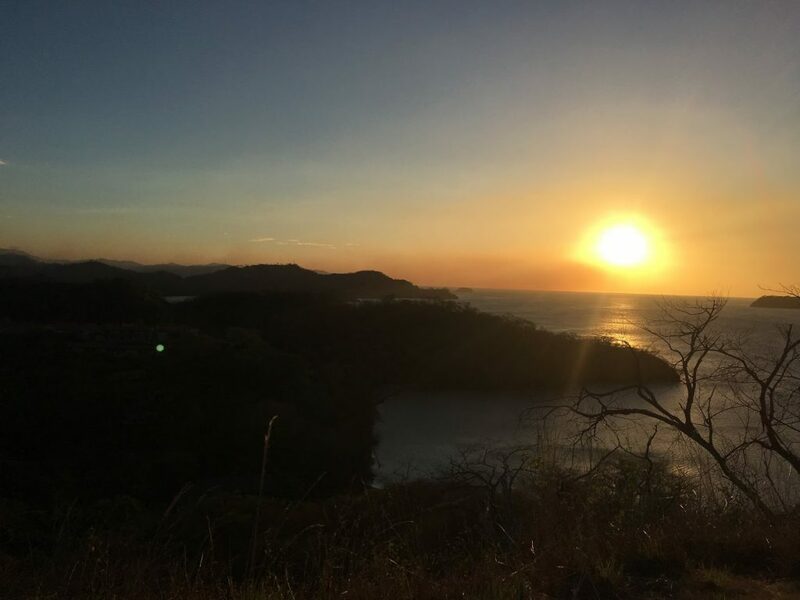 What is Costa Rica like? Weatherwise, it depends on where you stay. 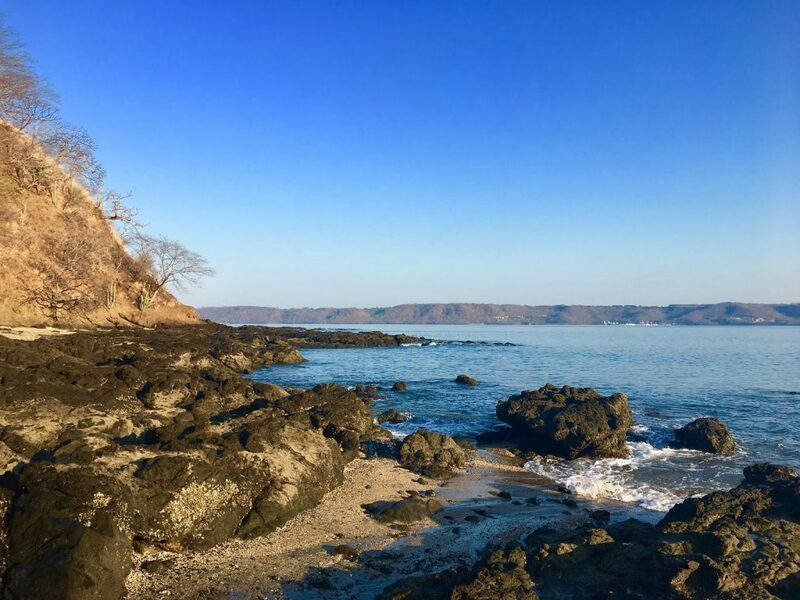 This trip took us to Guanacaste, located on the Pacific side of this Central American country and the driest region of Costa Rica. Temperatures were in the mid to upper 90s with low humidity. 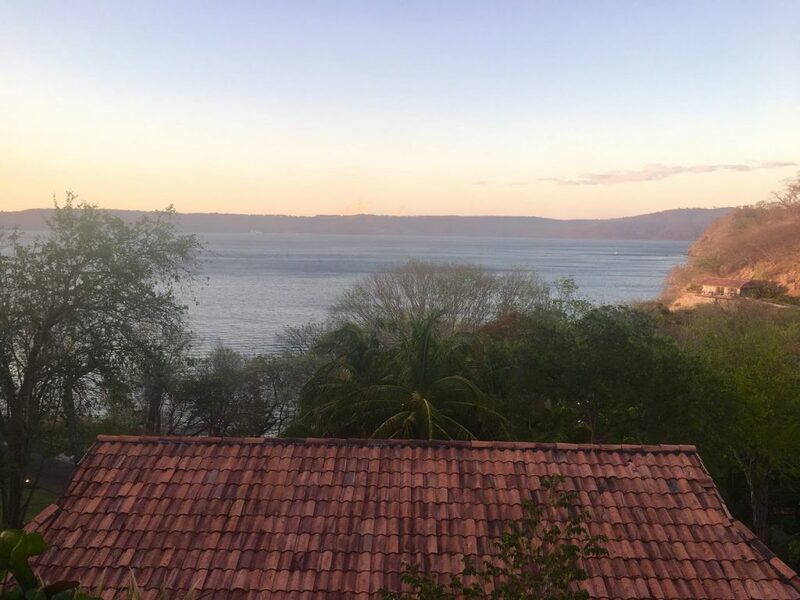 The sky is nearly always clear — while you’ll see clouds rolling off the volcanoes in the distance at the ocean it’s mostly direct sun all the time. If you come outside of the rainy season (typically Sept-Nov) you won’t have to worry about rain. I’m told February is the ideal time to travel here, though the tradeoff for perfect weather is the leaves are changing over so the trees won’t be quite as brilliant as normal. The people of this country are some of the most fulfilled, spirit-filled, fun natives to be around! 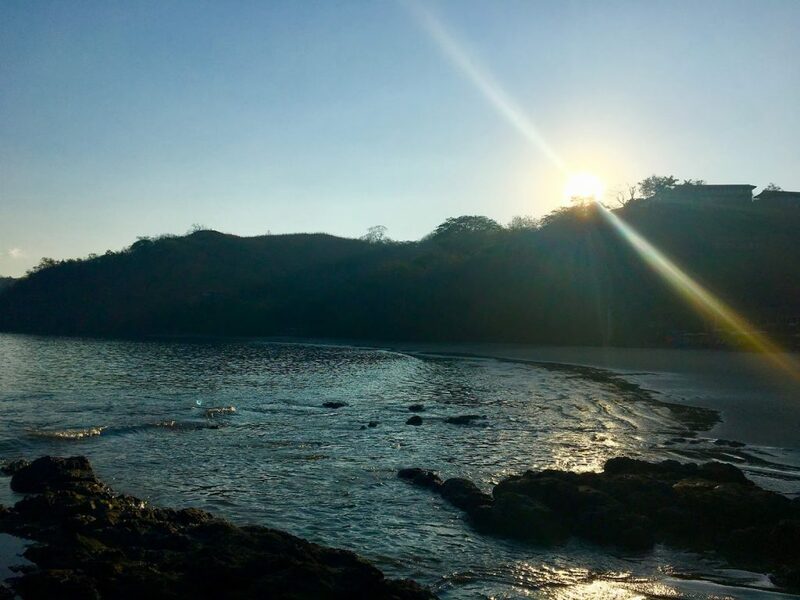 The motto of Costa Rica is “Pura Vida” — pure life. 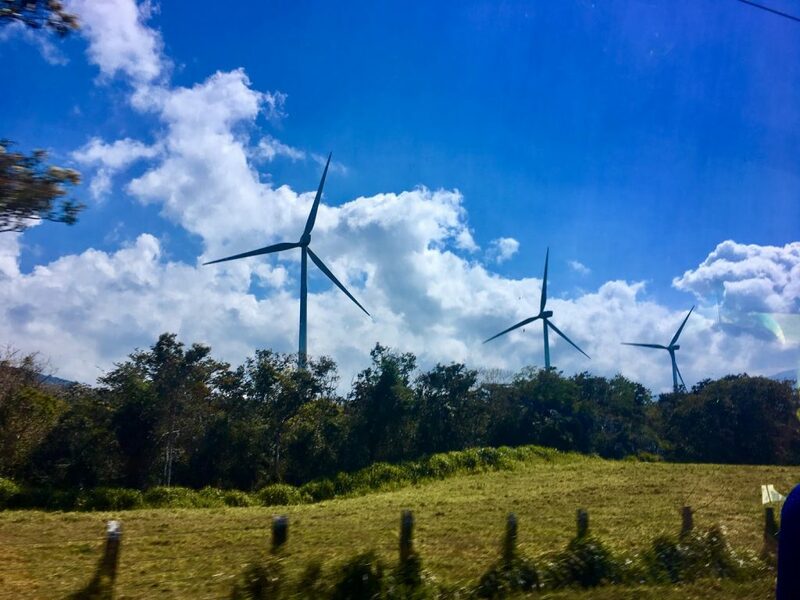 To Costa Ricans this means living life to its fullest, enjoying the nature and abundance of the country and welcoming tourists and wanderers with open arms and cups filling over. In all my travels I’ve never met such a friendly people. Though Spanish is the native language here, for the last 20 years all students have learned English in school, so you’ll be fine if you aren’t Spanish-fluent or even proficient yourself. You’ll never run out of things to do here either. With multiple volcanoes, rainforest regions, two oceans and mountains galore (plus art and culture!) there is plenty to explore and discover here. 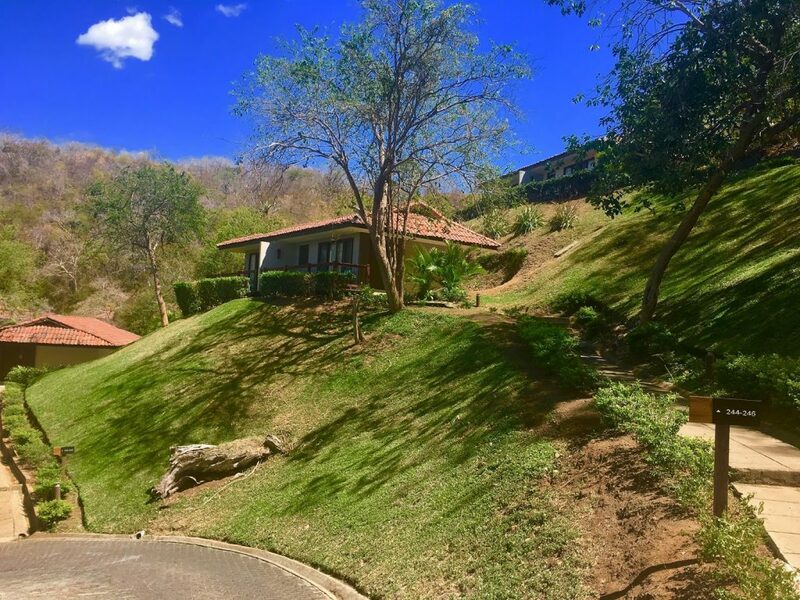 There are multiple licensed tour operators who are experts at getting you from your resort to where you want to be, and the roads in Costa Rica are generally wide and safe, though they do get quite twisty! I’m always amazed by the bus drivers here who can drive 75+ passenger buses around mountains and cities with ease. I’ve never felt unsafe in a car, van or bus here. More on our adventures for this trip below! 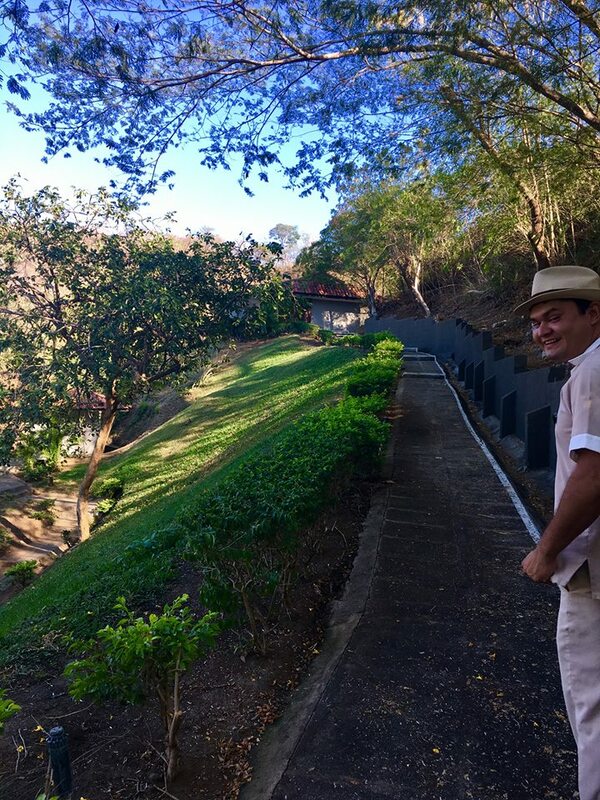 Our hillside resort had a mix of private cabanas and larger, more hotel-like buildings. We chose to stay in a cabana at the top of a hill — it’s the one way up in the far right of this photo! 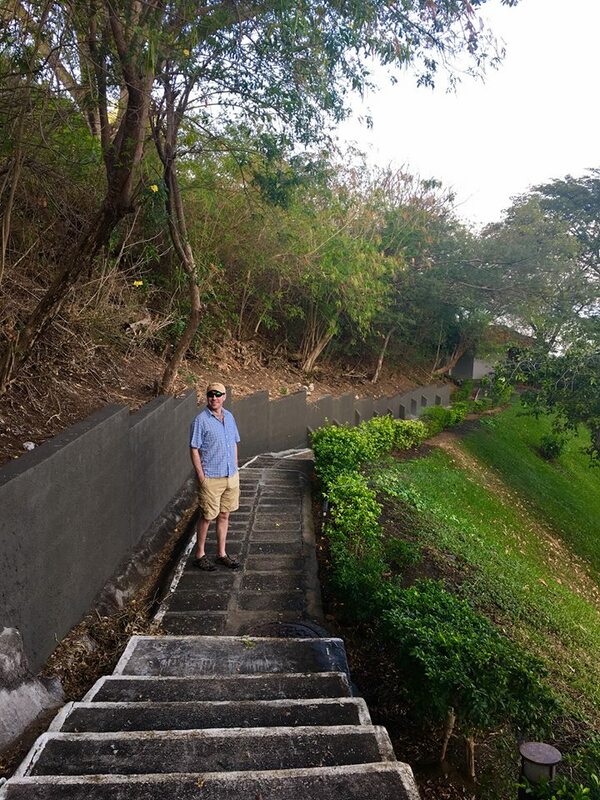 Our porter walks us along our private cabana sidewalk. They took care of getting all of our bags in for us! The bedroom, complete with large windows and a bay view. Our living room, complete with private balcony. There is a TV off to the left, as well as a mini bar! We found our resort through Cheapcaribbean.com — a site we’ve used twice now to book vacations with great success! 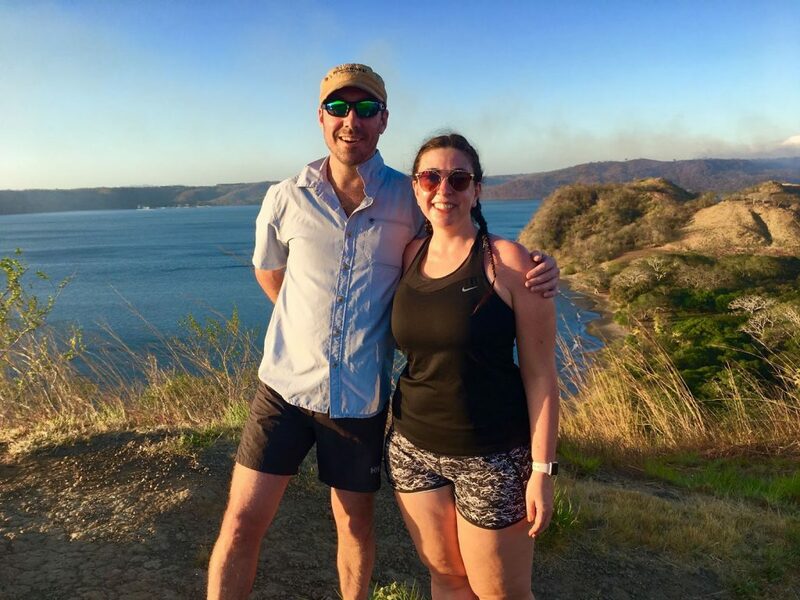 We simply searched for Costa Rica and then selected from their choice of available resorts that matched our desires and timeline. 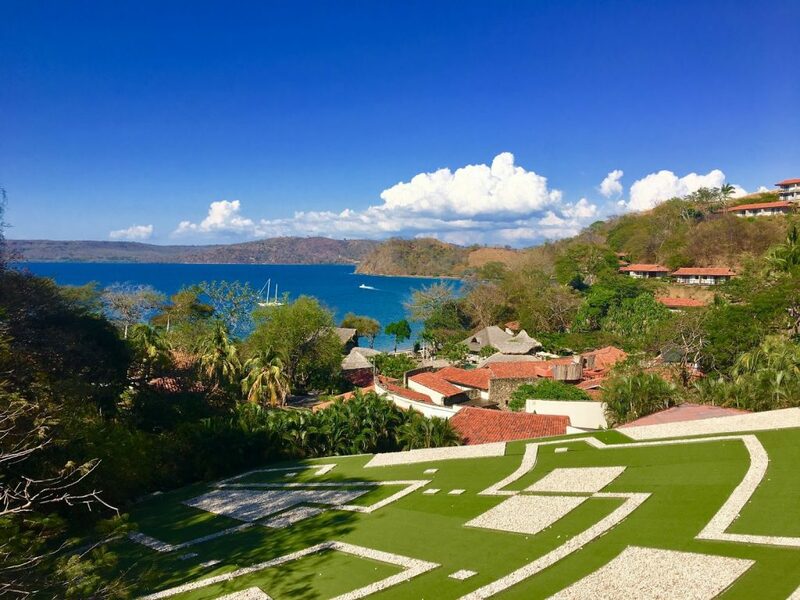 For this trip, we wanted an all-inclusive resort and chose Secrets Papagayo, a beautiful resort built into a hillside of Papagayo Bay. 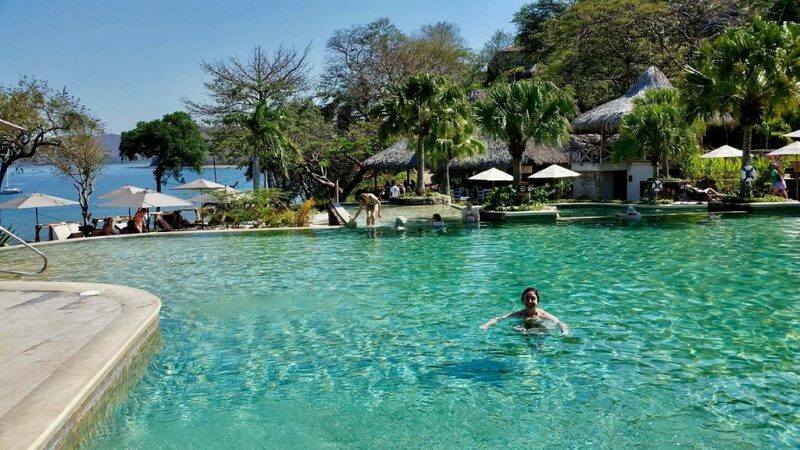 This particular resort is adults only which was glorious — not a single crying kid around! It did mean that the clientele skewed slightly older, more 30s and up rather than the college age and up with young families we’d seen on previous trips. That was totally OK with us! 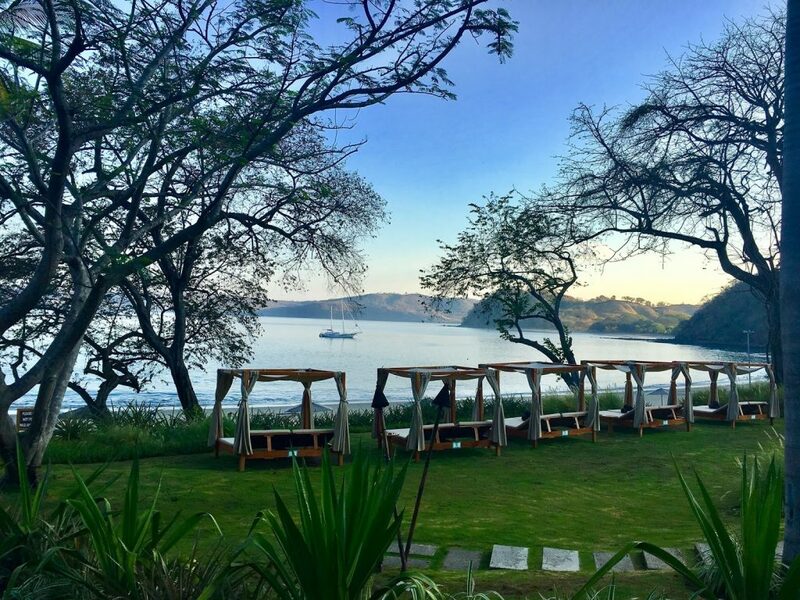 Located just 20 minutes from the airport, this resort is perfectly placed on the mainland of Papagayo Bay. 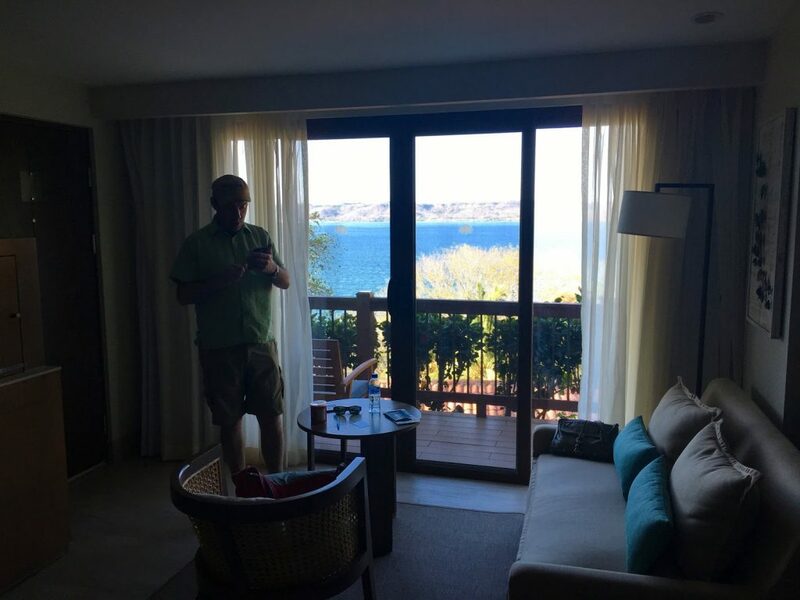 We didn’t hear a single plane the entire time we were there (the resort is not on the flight path) and unlike many Papagayo Bay resorts far-flung out on the arm of the bay, our mainland location gave us proximity to all the excursions we were interested in. We were often the last ones to get picked up for adventures and the first to get dropped off! That was particularly nice at the end of the day when the last thing we wanted was to be in a van longer than necessary. The resort has two styles of rooms: private cabanas perfect for couples or larger, hotel-like buildings that are great for groups. 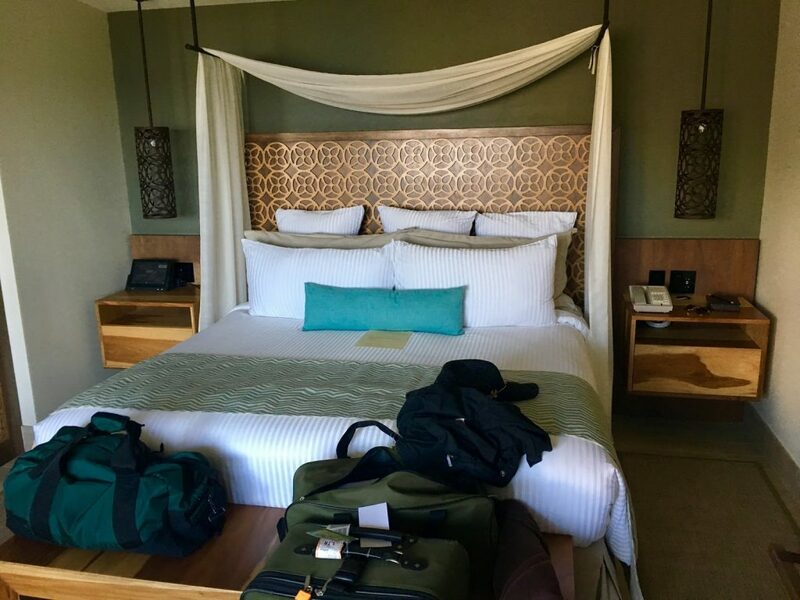 Our private cabana was perfectly located on top of a hill (you can walk or take carts that run every few minutes) with incredible views from our bedroom, living room and even the shower! Down below us were 5 restaurants, 3 pools, a hot tub and of course the beach. 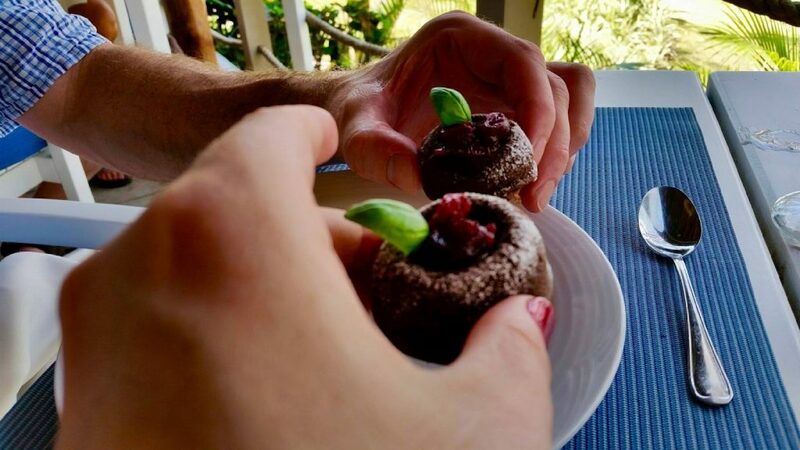 There were tons of activities each day run by the hotel ranging from hikes to crafting to kayaking and snorkeling. The resort has a very appealing relaxed vibe. All of the staff answers any request with “It is my pleasure” and I truly felt like they meant it. We could not have asked for a better place to stay. Here are some more shots from around the resort. In the pool — even better! On our private hilltop walk. Walking down to the ocean. Wearing: Sunnies | Top | Shorts | Sandals — full vacation OOTD coming next! 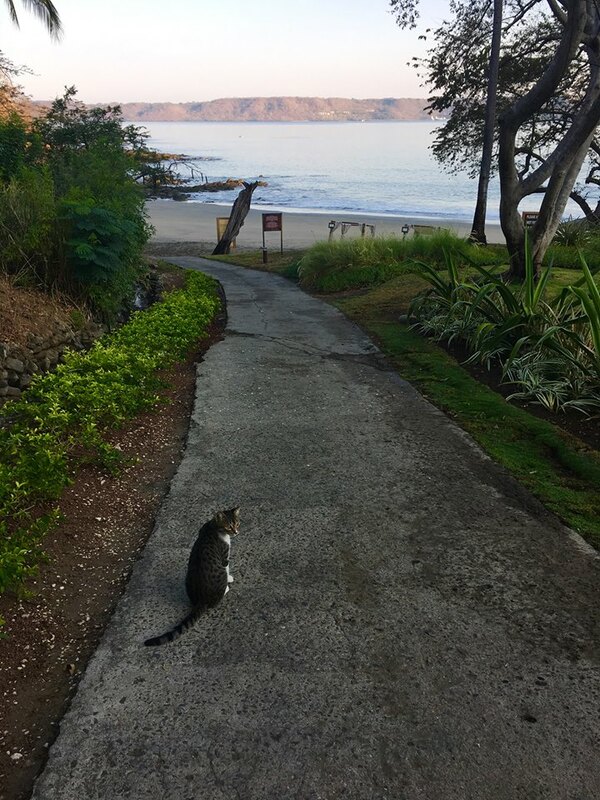 One of the hotel’s kitties decided to join us on our walk! Do they count as wildlife? Beach cabanas overlooking the bay. The sand at our resort’s beach was mostly volcanic, but a lighter grey (thus not as hot) close to the water. Looking up towards the main area from the beach. 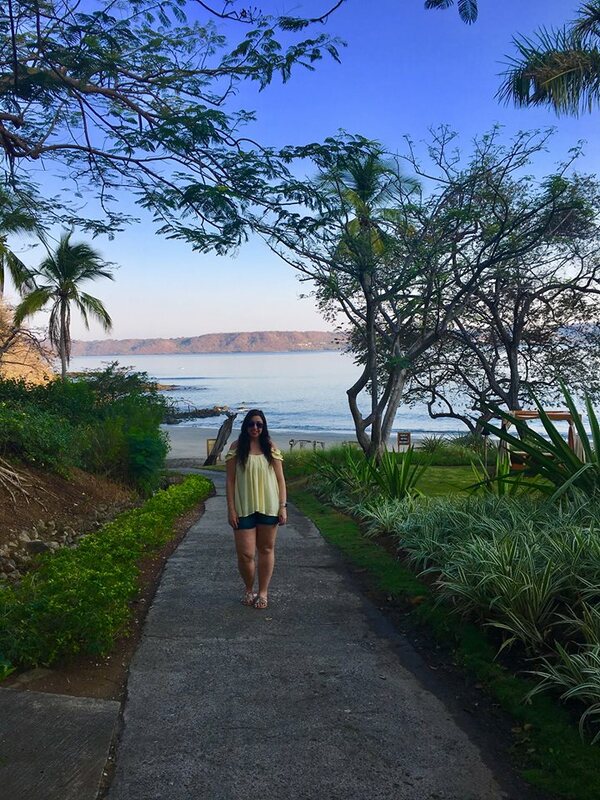 I would say Secrets Papagayo is a 4-star resort with some 5-star amenities. like the hash brown I snuck on to my plate. The Seafood Grill had bayside seating and amazing amuse bouches! 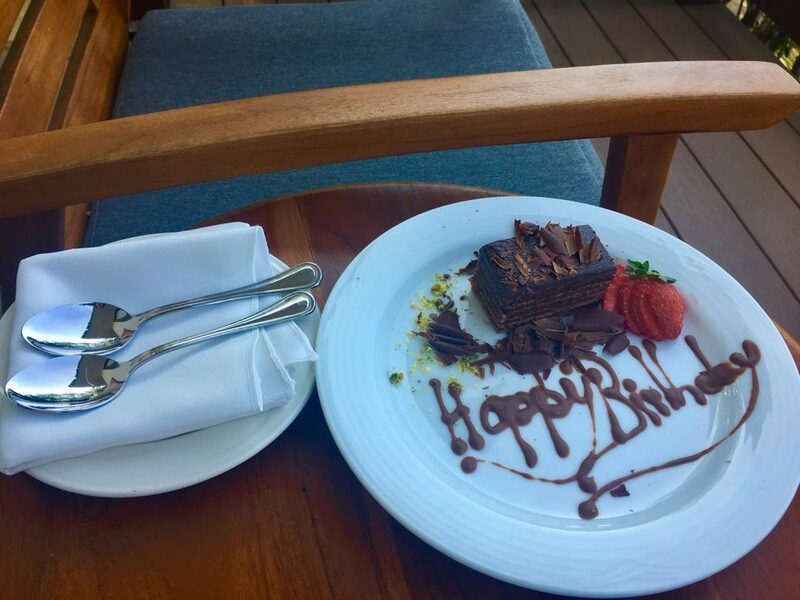 The staff surprised us in our cabana with a birthday treat for me! We ate it on our balcony. fruit-infused water for all guests laying around the pool. Ahhh, mudslide! The resort had a great selection of drinks — no cheap rum here! 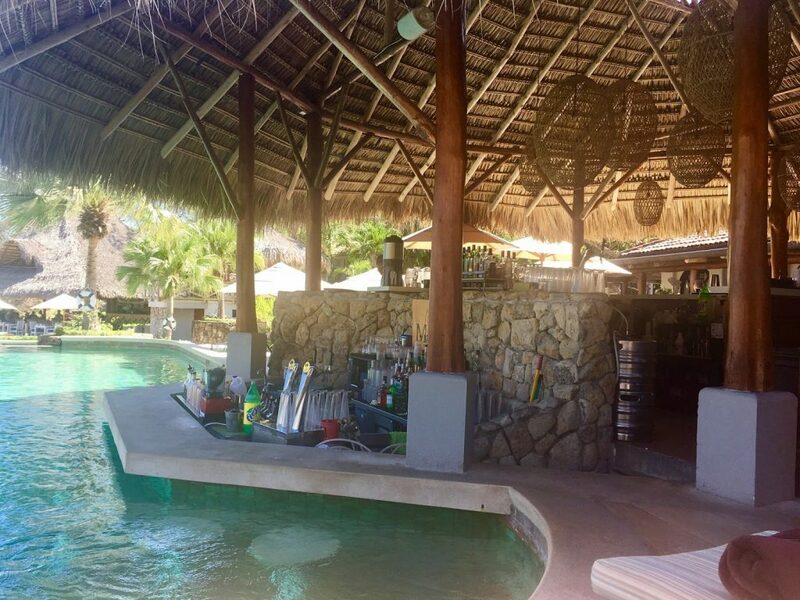 Like our cabana, the rest of the resort was clean and modern with plenty of Costa Rican flair. The main pool area was surrounded by 4 restaurants (a buffet which we hit often for sheer choice, a Seafood Grill that was for preferred guests only for breakfast and lunch and then open to all guests for dinner, a Japanese restaurant and an Italian restaurant, plus a poolside grill) as well as 3 bars, including one swim-up bar! Over by the spa was another bar and a health food restaurant, which we loved! Their green juice was amazing (probably helped in no small part by fresh pineapple inside). Generously sized palapas were everywhere for when we tired of the sun. As preferred guests of the hotel we were able to enjoy some extra benefits, like being able to eat at the Seafood Grill whenever we wanted and having access to a special lounge. 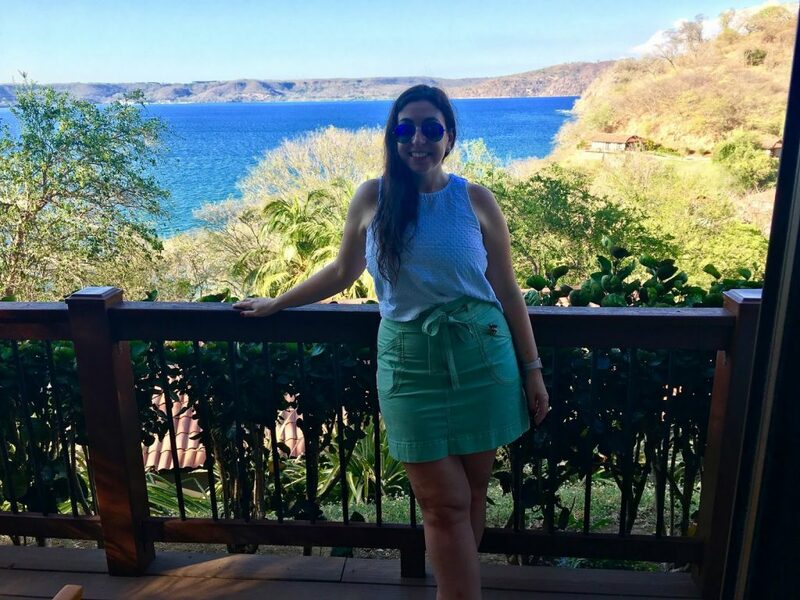 While it was nice, our favorite restaurant was the buffet because we loved having a wide range of choices from both American and Costa Rican culture to eat! 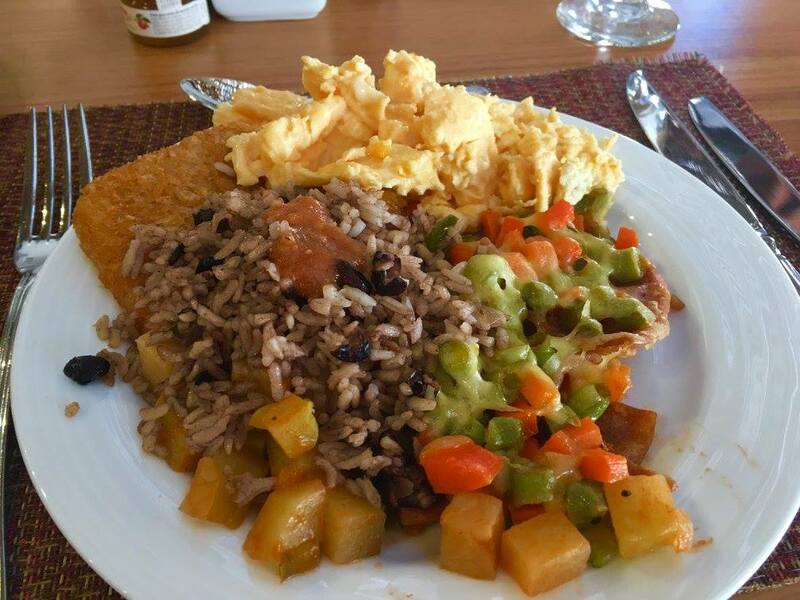 Eating in Costa Rica is like going on a cleanse. The food is all-natural, with no worries about antibiotics or any of that crap in the meat or veggies. The richness and flavor is incredible and the water here is potable in most areas, so no worries about stomach viruses or any bad reactions. Though my boyfriend and I ate plenty we both managed to lose weight while on the trip. Though that weight loss could easily have been undone by the plentiful alcohol! I’d learned my lesson after gaining 10 lbs on a trip to Mexico in 2010 — too many free sugary drinks are a bad thing! So while the Howler Monkey was amazing and the bartenders always stocked my Mudslides with extra chocolate sauce (YUM! ), I stuck mostly to fruit-infused water. This was the message at our excursion van changeover spot. See what I mean about Costa Ricans being friendly? 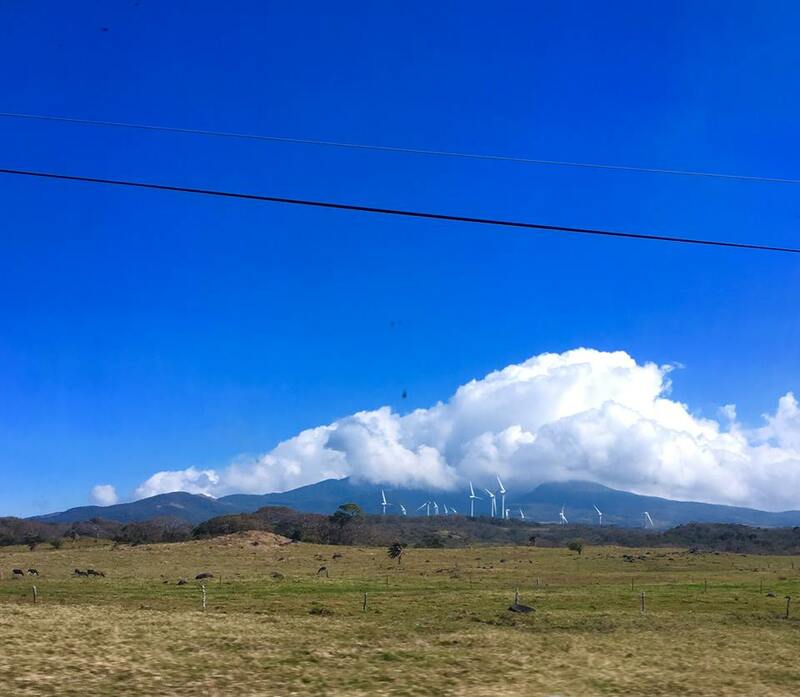 We headed from the dry lands of Guanacaste up between two volcanoes. Off in distance here you can see clouds rolling off the volcanoes and a windmill farm. 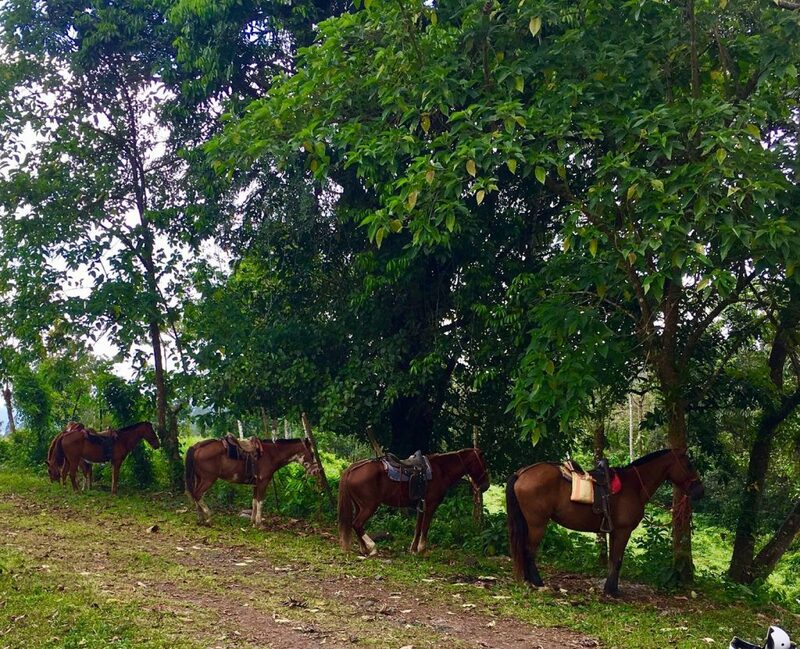 Horseback riding is very popular in Costa Rica, among natives and tourists! Our hike along the Blue River. The river has a silvery-blue color thanks to elements like silver and iron flowing through it. Pausing at a waterfall for a couple photo! Swimming in a different river’s double waterfalls. That’s me with my arms in the air in victory! BF and I await sunset on our sea level to hilltop hike. 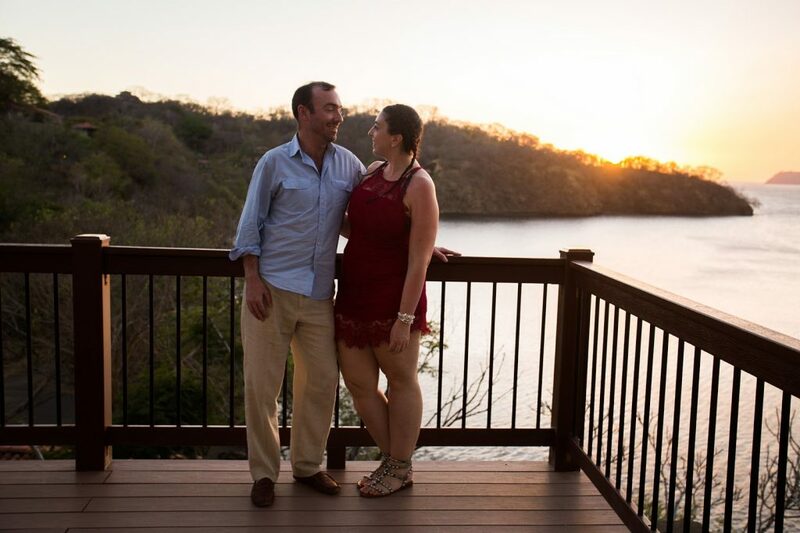 The sunsets from our resort were masterful. 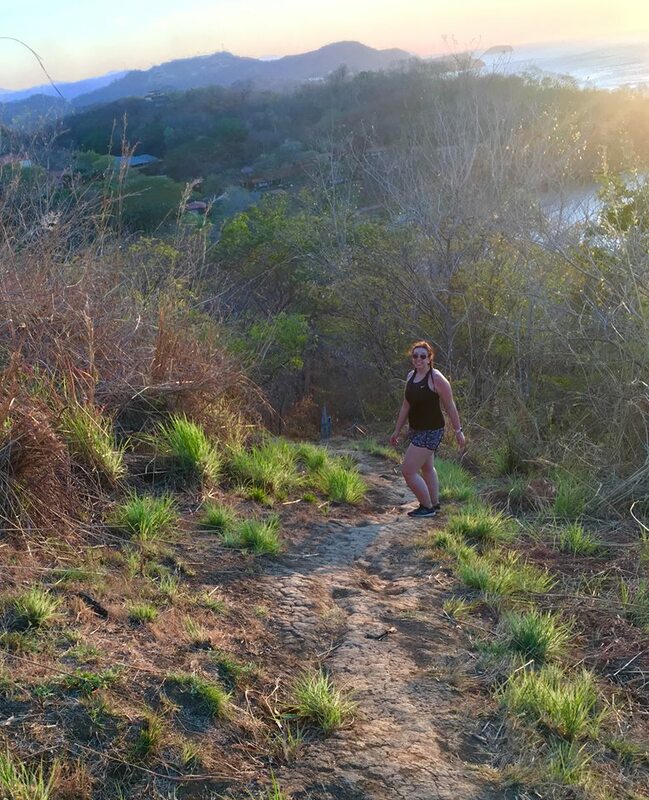 This hike would not have been possible during the rainy season! 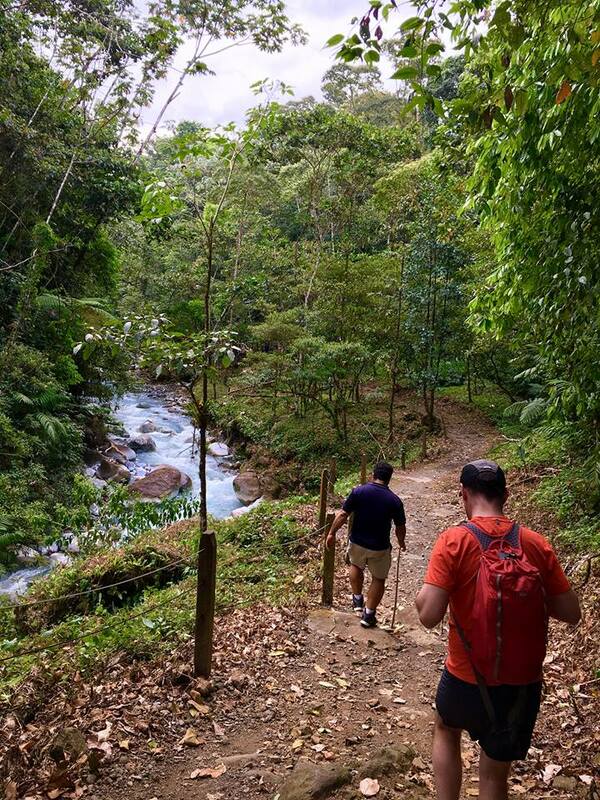 One of the great things about Costa Rica is adventures are right at your fingertips. 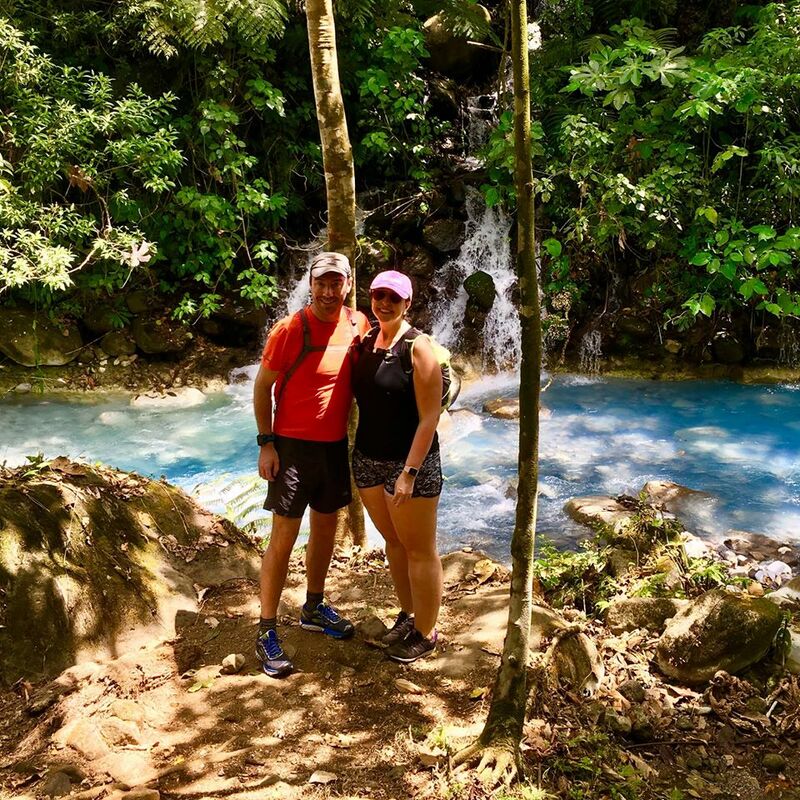 From the Monteverde Cloud Forest to the Arenal Volcano to plenty of adventure zipline/horseback riding/waterslide parks, the cool thing about Costa Rica is that very few places feel like tourist traps. 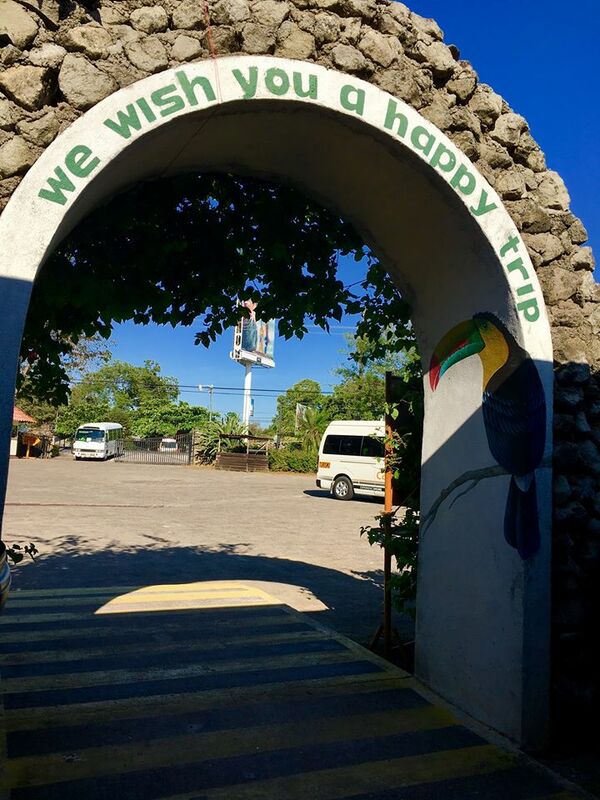 Here, your adventures will mostly involve hiking, walking along suspended bridges high above rivers, or perhaps being surrounded by butterflies in a netted garden full of them! On this trip we decided to snorkel (right at our resort! 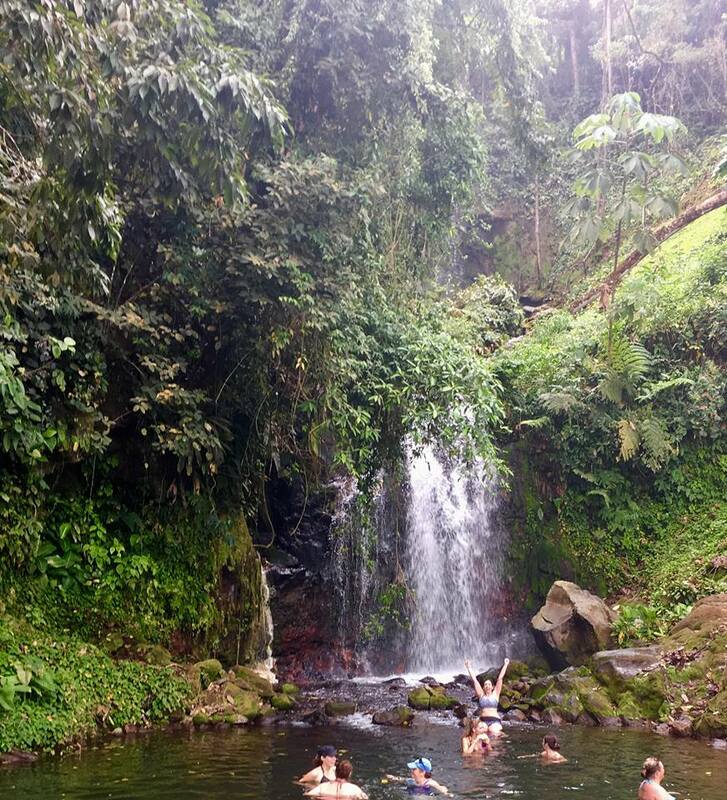 ), hike along a volcano-fed river, swim in a secluded waterfall, go to hot springs for a mud bath (sooooooo good! ), visit a butterfly garden and do a sunset hike at our resort. 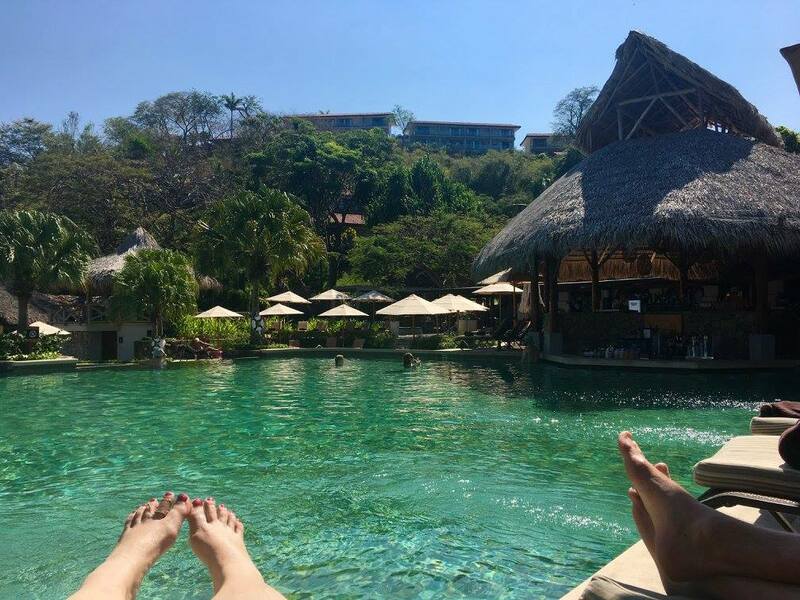 We could have done so much more but with only a week to enjoy relaxation, our goal was not to stress ourselves out over long trips to adventures or with too many other people. Other possibilities we ultimately decided to wait for a future trip to do included surfing, horseback riding, off-shore snorkeling in the Pacific Ocean and adventure parks. Perhaps the only downside to our desire to adventure was that most things we wanted to do were at least an hour away, sometimes two or more. Losing four hours in a day to getting there and back just wasn’t appealing on a week-long vacation. I’m sure we’d have done more if we’d been there two weeks. The more we relaxed into ourselves and the moment, the more wildlife we saw. 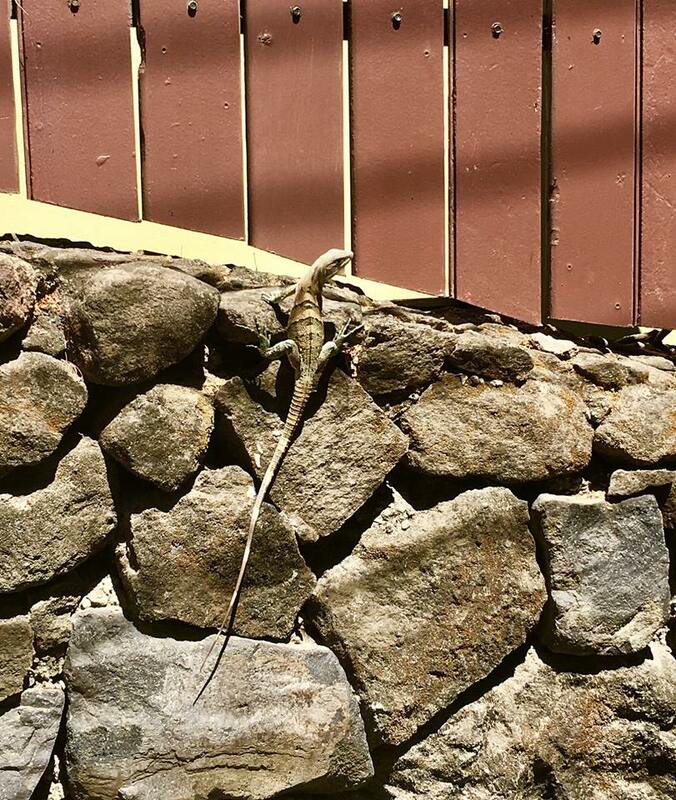 This lizard nearly blended in to his background! 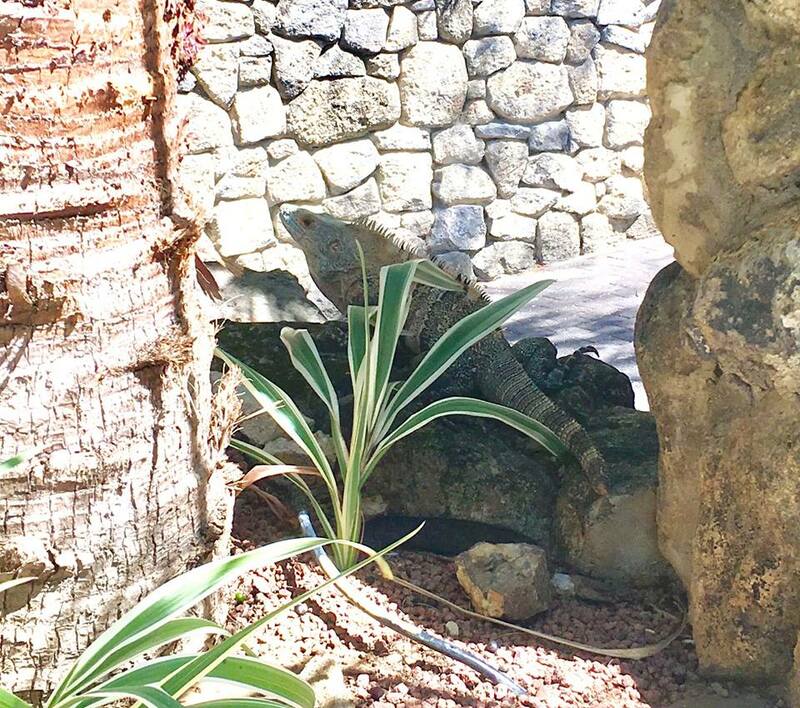 A huge iguana at our resort! 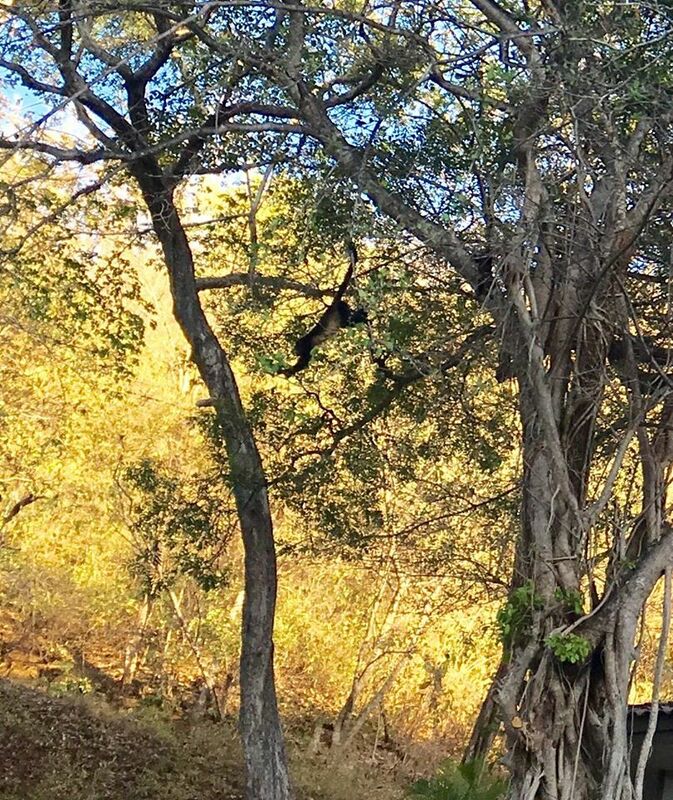 A Howler monkey goes for a swing! 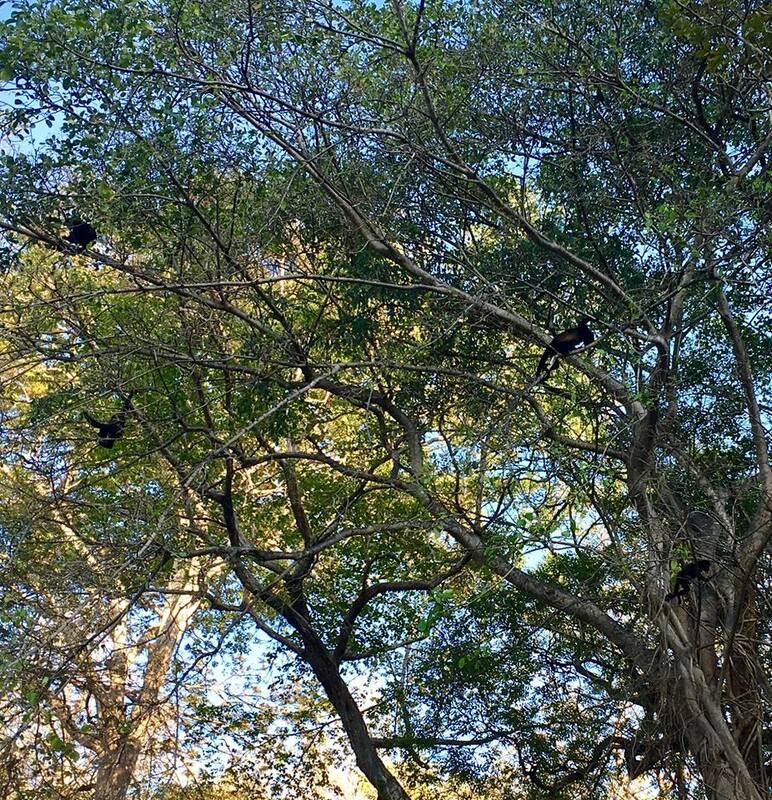 Later, a whole family of Howler monkeys including a little baby! A baby Cayman — eek! 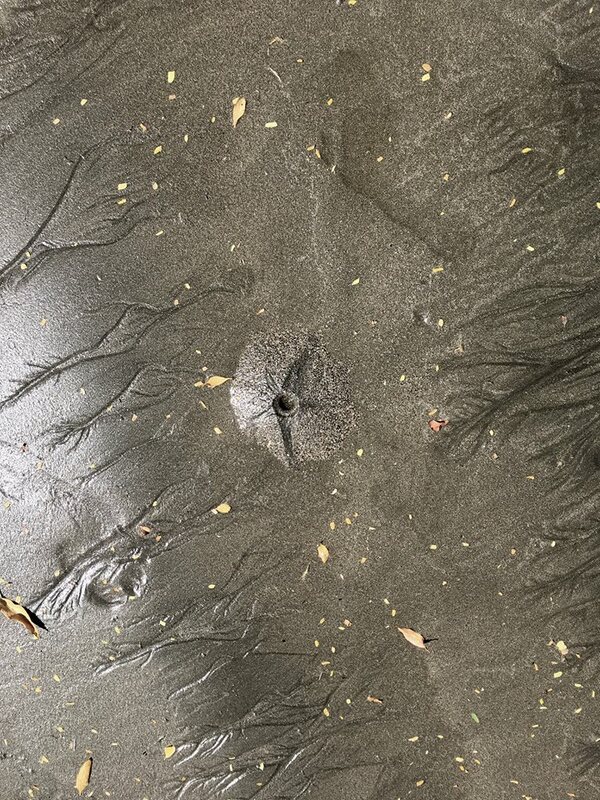 A crab hiding in his star-shaped hole at the beach. Every so often one of these would bubble over with sand, like a mini volcano! 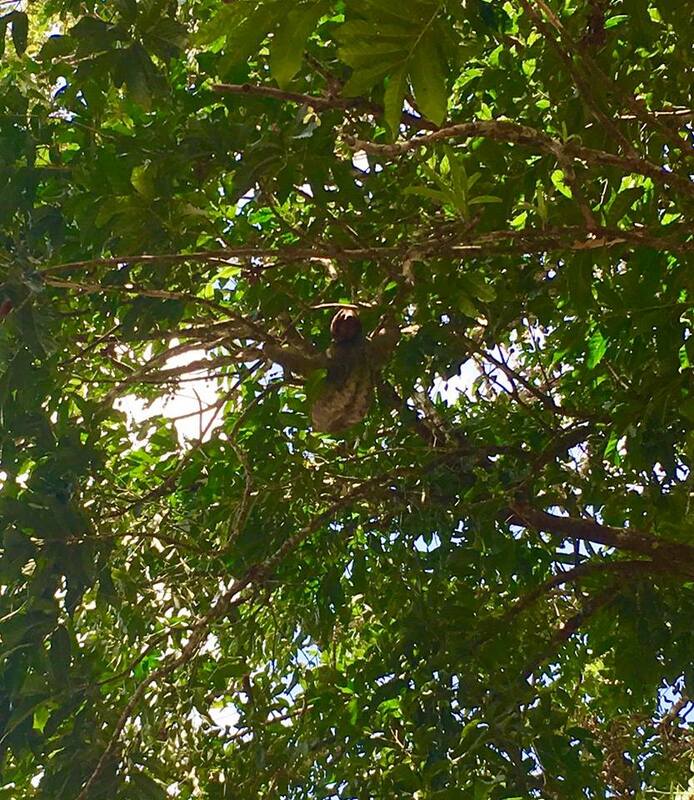 I had never seen a sloth so close before! We saw this three-toed lady at our hot springs. Maybe she wanted to dip too? 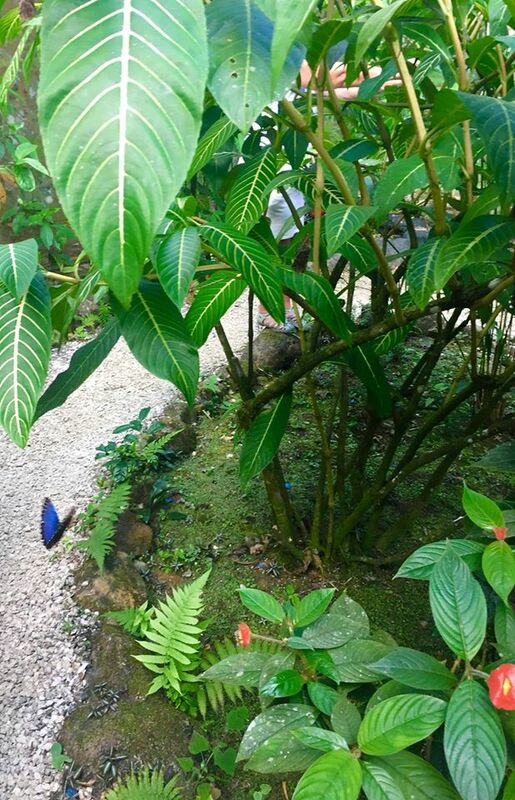 Butterflies galore including the Blue Morpho (a native Costa Rican species). 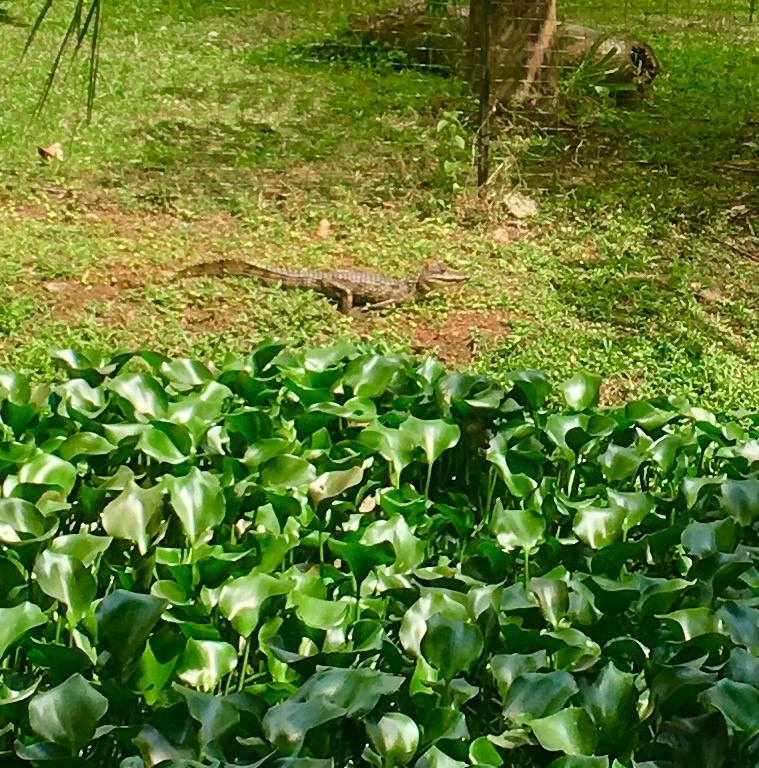 After my previous trips to Costa Rica I’ve bragged to BF about all the animals I saw. At first we didn’t seem to see anything on this trip but as we relaxed and became more chilled we began to see species all over the place! 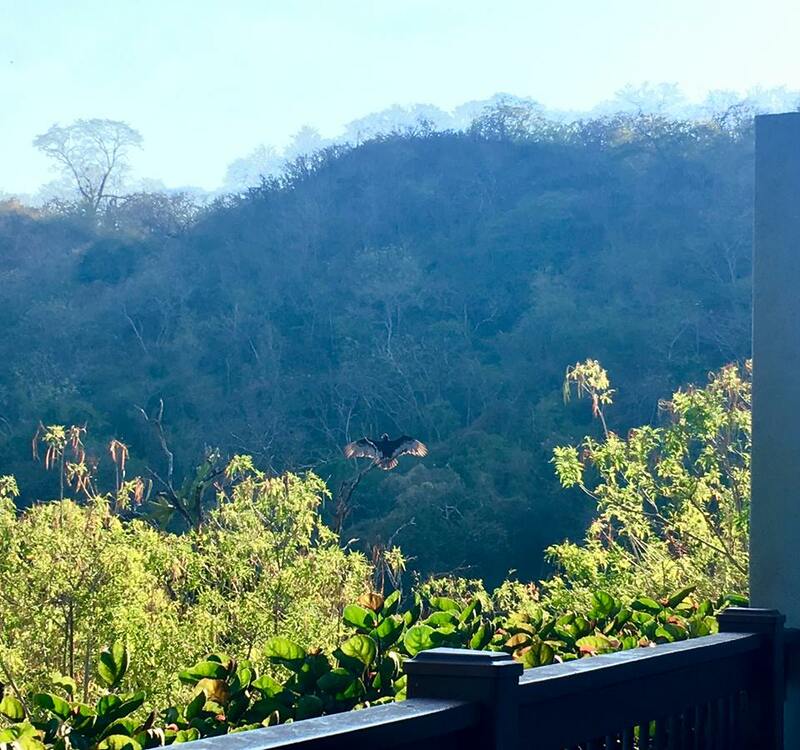 The highlight for me was seeing a sloth less than 20 feet away, and both of us immensely enjoyed getting up close to a family of Howler monkeys making their way through a part of our resort. If you’ve never heard a Howler’s call, it’s pretty hilarious! Overall, our trip was amazing. We couldn’t believe it when it was already time to go home! We felt fully revitalized yet could have easily stayed another 3-4 weeks. From the moment we booked our vacation via Cheapcaribbean.com we felt so taken care of, from the moment we stepped on our JetBlue flights to the moment we arrived back home in Brooklyn. 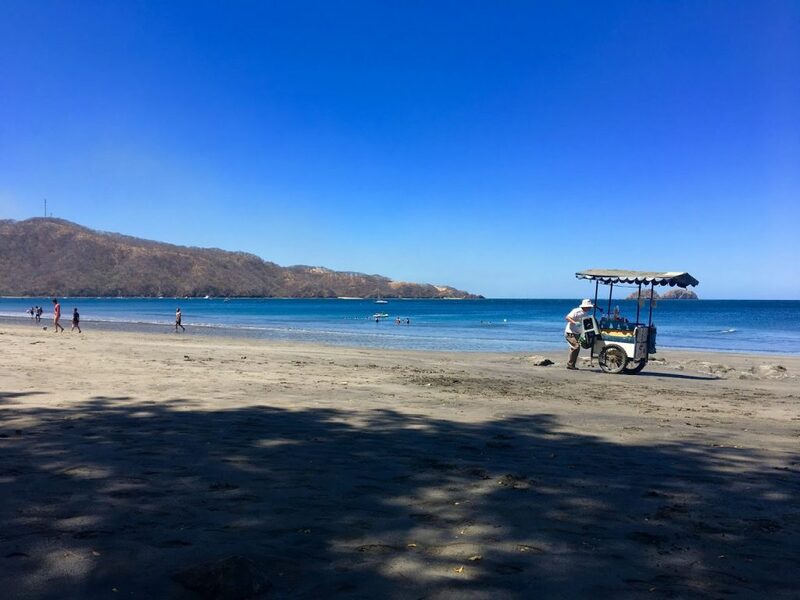 If you’re looking for a winter getaway, I can’t say enough lovely things about the Papagayo Bay in Guanacaste, Costa Rica. 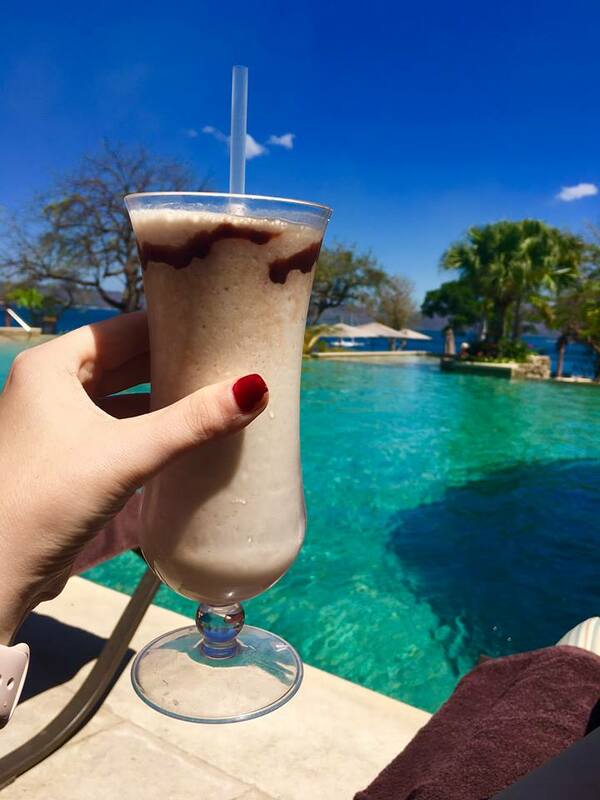 You’ll understand the meaning of Pura Vida, and you’ll feel wonderful. Coming up next: vacation outfits! Wondering what to pack on your vacation? See the first two parts of my series here. That trip looks amazing! Thank you for sharing the gorgeous photos.